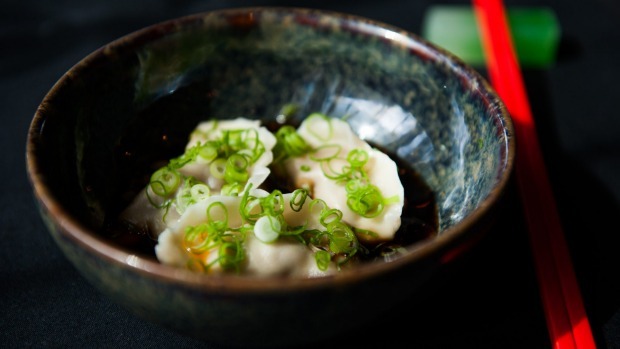 Add these 5 delicious dishes to your essential list of reasons to visit Canberra. Canberra's culinary scene is booming, with clever local and imported chefs putting a savvy spin on the freshest produce. When visiting the capital of culture, don't miss these mouth-watering tastes. One of the anchor tenants in the revitalisation of inner-city Braddon, Lonsdale Street Roasters draws a steady stream of visitors and locals in search of the perfect cup of joe. Created by Alastair Evans, the artisan coffee came first - and what glorious coffee it is - before demand for quality cuisine led to the opening of Lonsdale Street Eatery. Joined by foodie Paul Hutt, Evans now offers a well-edited menu of premium quality paninis and Euro-influenced bakery treats. The focus will always be first and foremost on the coffee, available freshly ground in take-home packs. Fuelled with a caffeine kick, take your time to explore Lonsdale Street's growing collection of boutiques and food providores. Government power may shift hands, policies might change and election promises will be broken, but one thing you can always count on is the sensual delight of a plateful of roast duck and mushroom pancakes from upscale restaurant Chairman & Yip. Prepared tableside, the pancakes are delicately thin, the duck is crunchy and tender in all the right spots, the sweet and salty hoisin dressing brings the silky mushrooms to new heights. 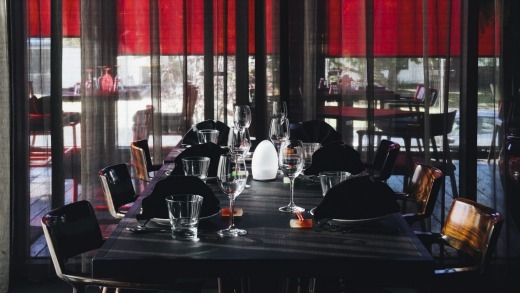 The pancakes - along with other stand-out dishes including Shantung lamb belly and Sichuan-style half chicken with pickled cucumber and soy broth - have made this elegant restaurant a preferred venue for powerbrokers on both sides of the party divide for decades. Of course you don't have to eat Monster kitchen and bar's yabby jaffle at midnight - the bar menu is available from noon 'til 1am, after all - but somehow it just tastes better at the tail end of a big night out. Served piping hot and loaded with butter, horseradish and creme fraiche, the jaffle is one of chef Sean McConnell's gifts to the city's hungry tums. Late-night revellers pour out of nearby Parlour Bar and into Hotel Hotel (Monster kitchen is on the ground floor of the hotel) in search of jaffles, pork neck bao, Moonlight Flat oysters and more. In a defiant show of caloric anarchy in the face of a world obsessed with low-cal, low-carb, no-sugar, no-fun fads, Pâtissez's indulgent dessert menu is gaining international fame. 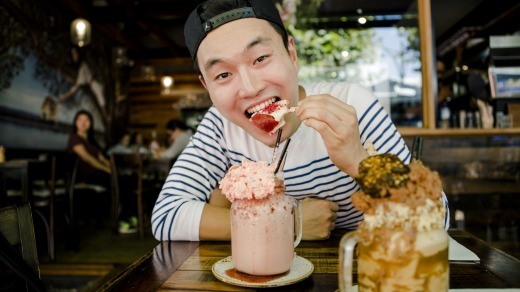 Opened less than a year ago, Pâtissez burst onto the Canberra scene - and into the social media stratosphere - with epic "freakshakes" that could have been dreamed up by Willy Wonka himself. Loaded with chocolate fudge brownies, salted caramel, Nutella, crunchy pretzels and fluffy marshmallows, the shakes are served at Pâtissez's bakery and cafe in the well-heeled neighbourhood of Manuka. Expect queues... And a sugar hangover. 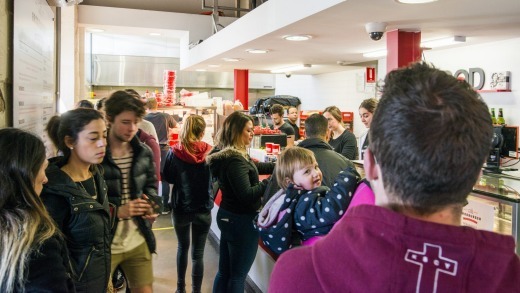 You try telling Canberrans it's just a burger. 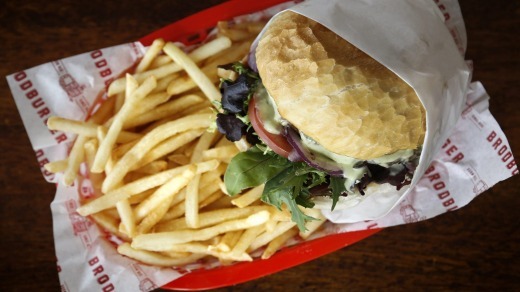 Brodburger's beast of a concoction, the Broddeluxe, is the super-supreme of Aussie fast food, served with attitude and panache at the restaurant's Kingston Foreshore location. Stacked with two (yes, two!) 200 gram flame-grilled beef patties, two eggs, loads of crispy bacon, lettuce, tomato, Spanish onion, homemade aioli, tomato relish and a choice of blue, Brie, Swiss or cheddar cheese, it's big enough to share, though you probably won't want to. At $20.50 it's priced higher than your average burger, a price well worth paying according to devotees. Also on the menu, the Brodburger (a more modest $14), and burgers featuring chicken, salmon-and-aioli burger, bacon-and-eggs and more. Save room for the hot and crunchy onion rings. Qantas and Virgin Australia fly to Canberra from Australian cities including Sydney, Melbourne, Brisbane and Perth. See qantas.com and virginaustralia.com. A new International Departures Lounge, set to open in September, will link Canberra Airport to the world. See canberraairport.com.au. The capital is a 3-3.5 hour drive from Sydney. See hertz.com.au for car rental. This article brought to you by Visit Canberra.